AFFORDABLE LUXURY LINENS. Experience the best in affordable luxury with these Brushed Microfiber Pillowcase Sets. 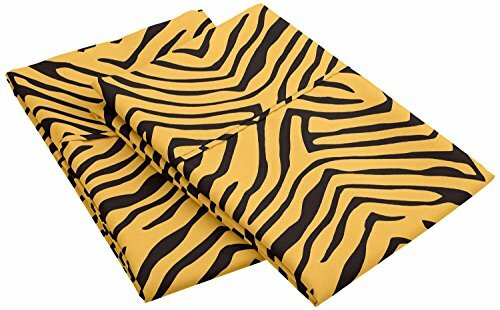 Made from Premium Polyester, these pillowcases are soft, comfortable, perfect for everyday use, and wrinkle resistant. These single ply pillowcases have a striking sateen finish to them and feature a pleated detail at the hem. Brushed Microfiber is strong, durable, and if cared for properly, will be long lasting. DURABILITY. 1800 Series Brushed Microfiber is soft, strong, and if cared for properly, will be long lasting. CLASSIC STYLE. The variety of vibrant colors are available in various sizes, featuring a lustrous sheen from the sateen finish. Complete your bedroom décor with the coordinating Duvet Cover and Sheets for a plush, put together look. EASE OF CARE. These beautiful pillowcases are colorfast and machine washable. For drying, tumble dry low and remove them promptly from dryer. Always follow care label instructions for best results.